I chose to examine these two cards together because they can form two halves of an equation- they represent opposite sides of the same concept, and work best when in balance together. Together, they represent the forces of growth and change in our lives. First in the deck is the Empress, who is commonly depicted surrounded by grain, sometimes water, and the "fruits of the Earth". This gives us a clue to the card's meaning- a supporting force. It's hard to find a description of this card that doersn't contain the word "nurturing", and this also is an aspect of the card. It represents expansion in the form of growth and development- as a plant expands, so this becomes the message here. 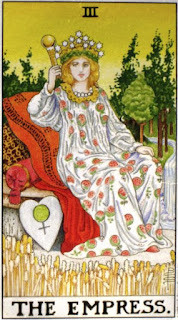 The Empress is the support and foundation for that growth, as well as the process of growth and development. 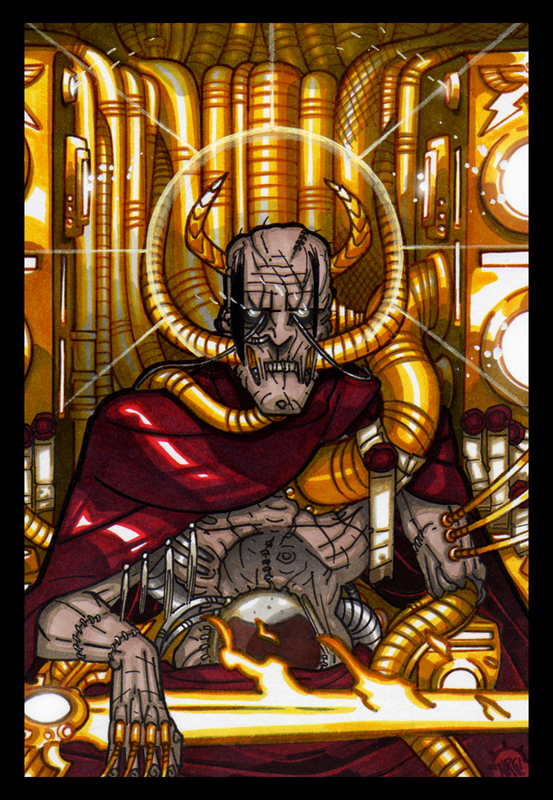 But like all cards, this too has its more negative aspects- here, the warning is that uncontrolled or unsustainable growth can ultimately lead to chaos, and destruction. It can also be smothering, attempting to control everything in life, and instead of allowing for growth, it crushes it. So in its positive sense, this represents the fuel for growth and development. In its more negative connotation, it tells of excess growth; mutation, loss of structure and eventual chaos coming from rampant, unchecked expansion, or trying to control growth too much, ultimately stifling and smothering it. 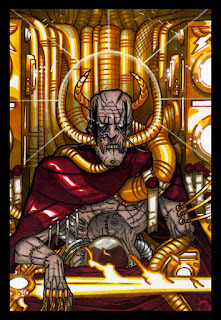 Now on to the Emperor- often the Emperor is shown with an orb and scepter- long viewed as symbols of dominion and reign. And in this way the Emperor represents the opposite of the Empress- whereas the Empress tells of growth and expansion, the Emperor tells of restriction and discipline. Another aspect of this card is also wise ruling- discipline where it is needed, freedom where freedom is needed. The message is to allow for growth, but to limit the amount of growth and in so doing, give it structure and shape. Both of these are needed for a healthy organism, biological or otherwise. The Emperor represents guidance and giving structure, whereas without this structure the growth would lack pattern and order, ultimately serving no purpose. At times both are needed- both expansion and growth, but not unchecked growth and wild expansion all over. Again, consider a plant as a metaphor of the relationship between these two halves- the nature of a plant is to expand and grow, yet it's where it doesn't grow that gives it the ability to survive. It grows stems and leaves to take in the sun, and roots to go deep to find water to keep it alive. In this way, we see the expansive force and also the restrictive force. Perhaps a better word for it than restrictive could be structuring; it gives the plant structure and shape. Were this plant too excessively restricted, it wouldn't be able to grow at all, and if its growth didn't fall into an order and pattern, and expanded faster than the plant could provide sustenance for, it would ultimately fail as well. So the message of these two cards is to impose structure and sensible limitations, yet at the same time allow for things to unfold as they will. Often the power to direct the growth and change in our lives lies with each of us, and to govern that change and direct it to our own ends is within our own powers. Often it's simply a question of taking the reins, or taking the orb and scepter, if you'd rather, and guiding our lives in the direction we ourselves choose.